ESP marks the beginning of a revitalization for Miles Davis, as his second classic quintet -- saxophonist Wayne Shorter, pianist Herbie Hancock, bassist Ron Carter, and drummer Tony Williams -- gels, establishing what would become their signature adventurous hard bop. 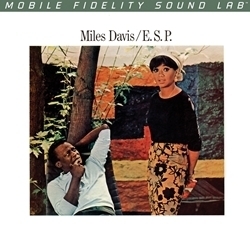 Miles had been moving toward this direction in the two years preceding the release of ESP and he had recorded with everyone outside of Shorter prior to this record, but his addition galvanizes the group, pushing them toward music that was recognizably bop but as adventurous as jazz's avant-garde. Outwardly, this music doesn't take as many risks as Coltrane or Ornette Coleman's recordings of the mid-'60s, but by borrowing some of the same theories -- a de-emphasis of composition in favor of sheer improvisation, elastic definitions of tonality -- they created a unique sound that came to define the very sound of modern jazz. Certainly, many musicians have returned to this group for inspiration, but their recordings remain fresh, because they exist at this fine dividing line between standard bop and avant. Pressed at RTI, Mobile Fidelity's 180g 45RPM 2LP set of E.S.P. treats each phrase and every note as sacred communication. This meticulously restored audiophile version renders the music's dynamics, pitch, colors, and textures with lifelike realism and proper scale. Reference-caliber separation, wall-to-wall soundstages, and distinct images magnify the intensity and beauty of Davis and Co.'s creations. Whether it's the distinctive snap of Tony Williams' drum sticks against the snare head, air moving through Davis' trumpet, acoustic thrum of Ron Carter's bass, or upper register of Herbie Hancock's piano, the sound is better than you'd even hear in the most intimate jazz clubs. Prepare to be swayed on every level. Interlocking lines drive "Little One," alternating rhythms pulse through the funky "Eighty-One," melodies soar on the balladic "Iris," the aptly titled "Mood" broods over minor-key structures, and "Agitation" – goosed by a two-minute percussive introduction by Williams – delivers on its promise. No record – and no group of musicians – have ever balanced coherent themes and exploratory playing in better fashion than Davis' quintet on E.S.P. It's the avant-garde record even jazz traditionalists love, and essential on every level.